Was Adam Smith Really the First Economist? 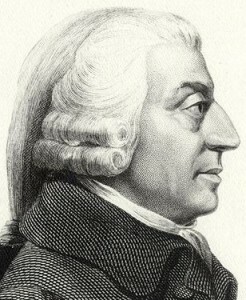 Many economists trace their origins of their science to the writings of Adam Smith (1723-1790). The Scottish social philosopher and political economist supposedly laid the foundation for economic thought with his book, The Wealth of Nations. He is credited, for example, for being the first to denounce monopoly. “Adam Smith was by no means a pioneer but a voracious reader and a master in the difficult art of synthesis. He used not only the materials contained in the technical treatises of the French physiocrats and the English mercantilists but also the ideas and concepts scattered throughout the great books, philosophical, historical and legal, which are the common heritage of western civilization. It is, therefore, not surprising that Adam Smith’s monopoly theory, far from being original, can be traced back to Aristotle’s Politics” (Julius Kirshner, ed., Business, Banking and Economic Thought in Late Medieval and Early Modern Europe, Selected Studies of Raymond de Roover, University of Chicago Press, Chicago, 1974, p. 273).